I like the style of this dress! I ordered my size, and it's actually a little bigger than I thought. I would suggest that anyone get a size smaller than they're actual size. After getting alterations (which were easy to do), it fit perfectly! Great dress for the price! Finally I received my dress today which I was waiting so much (the package was on hold at the customs)! In overall the dress is fitting well - I am happy!!! I have to make the skirt a bit shorter, because I like it more this way. I am 160cm tall, usually wearing S and XS sizes (I ordered size 2), so the dress would be perfect for the person who is 165-170cm. Dress is going to be worn at the beach on January15, only question is whether I should wear heels/shoes or not - have not decided yet! 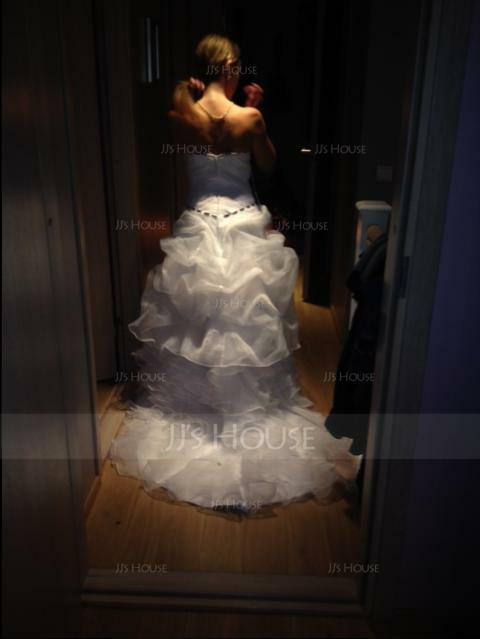 I LOVED my wedding dress! Although nervous about buying a online garment that would make an huge difference on my most important day, I couldn't have made a better choice!! I plan on buying from JJ's House for all my important occasions. As a matter of fact ; I'm in the process of ordering my daughters wedding gown.Beautiful gowns, with amazing prices! Thanks JJ's House, you're such a lifesaver!!! !